Michael had overseen the family’s crime syndicate grow to titanic proportions when he approached friends in Italy about a possible diversion to his nefarious activities in America. He had eliminated all his rivals in various daring missions but it was his search for redemption – for the unfortunate loss of his brother in a fishing accident – that led him to absolve his guilt in the most dangerous pursuit on earth. His Italian contacts did not have the required authority to place him at Ferrari – Maranello’s power was too much to overcome – so he settled for the alternative manufacturer that had been involved in the sad loss of his first wife, Apollonia. The only problem for Alfa-Romeo was that they didn’t have a car ready for competition, they merely supplied a team called Brabham with the power-plant. At the thought that you may all feel I have taken leave of my senses, I’d best explain the connection. Al Pacino was the star of both the “Godfather” films and the 1977 Bobby Deerfield movie. In this film, Pacino wore the same helmet as Brazilian Carlos Pace and today is the anniversary of Pace’s single Grand Prix victory. 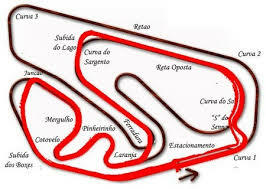 The original, daunting 8km Interlagos circuit in Sao Paulo is the setting for this historic event. Jose Carlos Pace had qualified his Brabham BT44 only sixth for the race but had converted this into third position by the end of the first lap after he passed Niki Lauda, Clay Regazzoni and a slow-starting Emerson Fittipaldi. Within five laps Pace’s team-mate – Carlos Reutemann – began struggling on his tyres and Jean Pierre Jarier overtook him for the lead. Pace caught Reutemann and would drive straight past him on lap 14 to take up the chase to the leading Shadow. Reutemann’s race disintegrated as he kept falling away from his team-mate and would eventually finish a distant eighth. As ever – throughout Jarier’s career – his car developed a technical problem which allowed Pace to close the 25 second gap – a fuel metering unit had failed and he coasted to a stop on lap 33. Pace took the lead and went on to win the race; followed home by Fittipaldi who had driven a breath-taking race to recover from sixth to within six seconds of the winner. The Sao Paulista’s in the grandstands went into ecstasy with the result and not just because they were of Brazilian nationality; Pace and Fittipaldi were also natives of the city. As were Ayrton Senna, Rubens Barrichello and Felipe Massa; which brings up a question I have often pondered. With World Champions of the calibre of Fittipaldi and Senna; race winners with eleven wins each in Barrichello and Massa – how is it that a great international track is named after a one time winner who was killed in an aircraft accident in 1977? What surprises me most is that they took eight years to do it… so there must have been a bit of a ‘discussion’, to put it mildly. Did the Pace family build a new grandstand, or something…? I never saw Bobby Deerfield – now I know why. Technically, that clip was rubbish. It gave no impression of the build up to a GP, and the race sequence was just a bunch of disconnected shots slapped together… And six minutes of Pacino, without shouting – must be a record. But a really nice approach to the ‘OTD’ series by you.